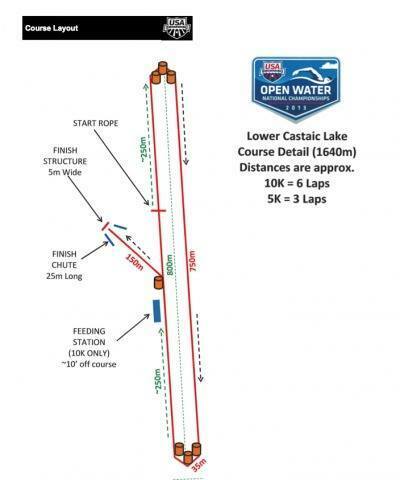 The venue: The course at Lake Castaic Lagoon will be a tight 1640 meter finger shaped course with six turns running parallel to the shore. The 10K will be six laps of the course and the 5K will be three laps. The course is oriented primarily along the north/south axis so swimmers will likely not have any issues navigating directly into the sun. You can see the course map below. The athletes: The USA Women currently are some of the top ranked open water swimmers in the world (three national team members in the top five of the current FINA world cup ranking). We’ve seen FINA world cup wins from Emily Brunemann and a runner up spot in Cancun taken by Eva Fabian. Haley Anderson, the Olympic silver medalist in the 10K just finished her senior year at USC where she completed her collegiate swimming career with two NCAA titles. Ashley Twichell, reigning national champion (in both the 10K and 5K), won the world’s largest open water race, the Midmar Mile in South Africa, last February and has been immersed in the rigors of the Mission Viejo protocol. Christine Jennings is currently ranked 5th in the FINA world cup rankings and has been training in Boulder Colorado. Becca Mann of Clearwater Florida has been a strong force in both the pool and open water. Mann was dominate at the 2012 Junior Pan Pacific championships and will likely be in contention in this very strong field. On the men’s side, keep an eye on Olympian Andrew Gemmell, last year’s 10K champion. Following last year’s open water nationals in Ft. Myers, Gemmell went on to Omaha were he won the 1500 and punched his ticket for London. His London Olympic teammate, Alex Meyer will certainly be strong in the hunt. At last year’s nationals Meyer was recovering from a broken colar bone but managed to finish in the top 10 – Meyer’s tactical smart and is injury free so watch out. Last year Janardan Burns and David Heron jumped into the second and third positions in the 10K; the word out of the OC is these two are primed and ready. It’s well known that Coach Bill Rose trains his Nadadores to finish hard. But like the women’s field, there’s a lot of talent and Joey Pedraza out of Florida and Jordan Wilimovsky from Santa Monica are bound to be in the strike zone at the end. Of course, Germantown’s Arthur Frayler who demonstrated a ferocious tenacity in closing in on the leaders at the 2011 open water nationals has to be on the radar too. Don’t forget about the Michigan distance group, which is becoming one of the best in the country. They put a pair (Sean Ryan and Ryan Feeley) on the World Championships team in 2011, and though they sort of stepped back into the pool last year, they’re now coming off of the momentum of an NCAA team championship and probably the hottest distance group in the country, so the tide might be in their favor.